Team American Rodsmiths Wins Big at Crawfish Festival. 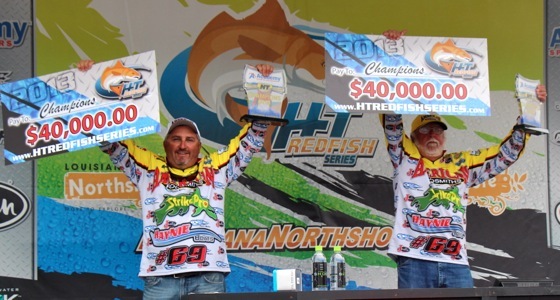 See all the results, stories and pics at the HT Redfish Series Website.It was an emotional weekend and this was an emotional win for the father and son team of Phil and Kevin Broussard. “It's been a lifelong adventure with my dad and I am so blessed to get to continue the journey with my best friend”, stated Kevin. 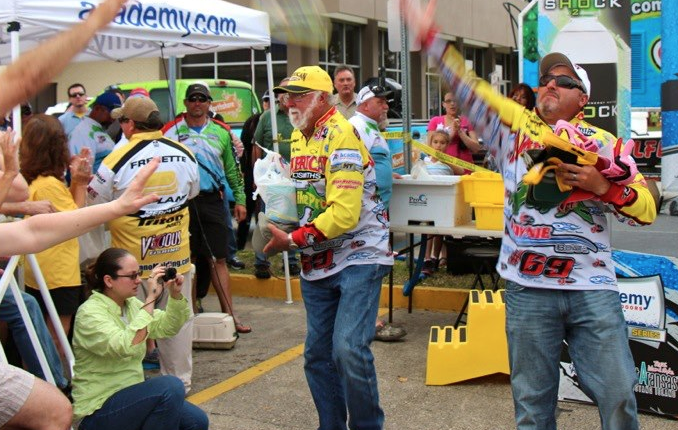 This team has won at every level but this one seemed especially sweet for a duo that now features one of the most successful guides in Lake Charles and the dad who has a highly ranked television show going on 20 years.As the weigh in began the Broussards were first up but before they weighed a fish they entertained the crowd by throwing out free hats, lures, fishing line and of course after they weighed their fish they worked the autograph line. It seems kids, dads and grand dads all wanted to get this team's signatures.The 35 teams that make up the 2013 Academy Sports and Outdoors HT Invitational Redfish Series fished Thursday and Friday with the top 10 teams moving on to fish in the finals on Saturday.After 3 days of hard nosed competitive fishing and with over 200 fish weighed in the anglers batted a perfect 1000% by not bringing in a single dead fish the entire weekend! 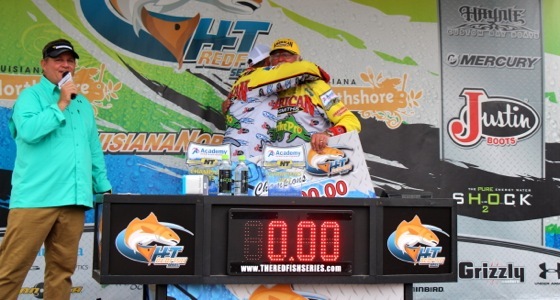 From the captain's meeting till the final handshake goodbye this entire weekend was one that will leave us feeling even more blessed to get to be a part of truly what is some of the best anglers and finest people anywhere in this great country.The Broussards were rewarded with $40,000.00 for their 44.78 pounds but weren't the only ones to cash this weekend. 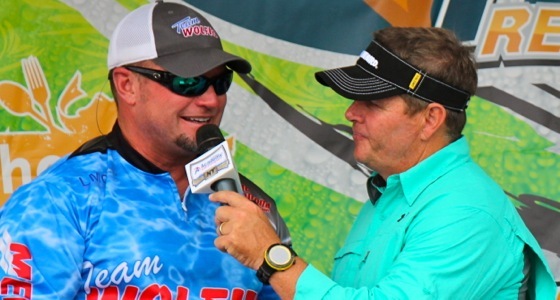 2011 and 2012's team of the year, Dwayne Eschete and Clark Jordan, Team Majek Boats came in 2nd place with 43.85 and took home $10,000.00 while 3rd place found Bobby Gilbert and Shane Dubose, Team Wolfie's/Waterloo Rods taking home a cool $7,000.00 for their 43.70 just 1.09 pounds from winning the event. The top 5 finished out with Gary Rettig and Manny Perez, Team AHR Metals taking the 5th spot while the Romeros, Joey and Jesse took 4th. All 10 teams took part in the $82,500.00 cash purse. It was a great weekend and we are glad to have played a small part in it. 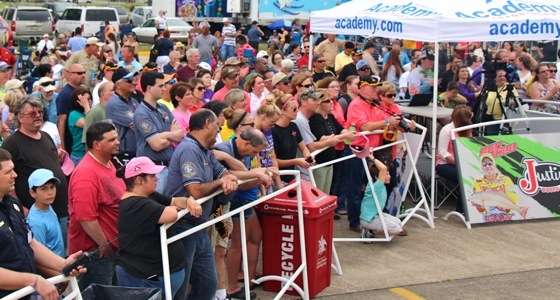 However, a weekend like this one does not happen without a lot of people helping.The St. Bernard Parish Govt., St. Bernard Sheriffs office and fire department as well as Cisco Gonzalez and his staff at the Louisiana Crawfish Festival, the St. Bernard tourism council, Gulf Outlet Marina and Motel and of course the HT Redfish Series staff. 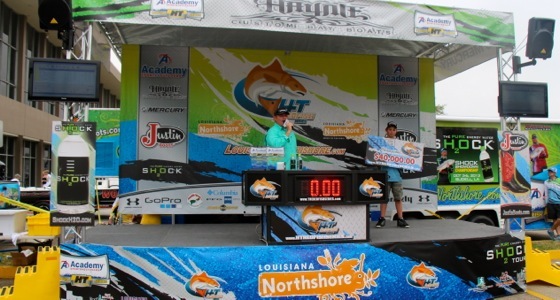 Next up for HT is the kick off of the Shock H2O Tour in Orange Beach, Fl. April 12-13 where a guaranteed $10,000.00 for first place will be paid in this 2 day event. Be sure and visit our fan page on Facebook and we hope everyone stays safe and lands big fish and life long memories until we see you again, either on the water... or on the web.